Summer is almost here, and kids are excited about being free from the confines of school. Summer and ADHD children can be a mixed bag for parents and their loved ones. The lack of structure and long summer days might lead to aggravated symptoms, especially since children with ADHD need to be constantly stimulated by new activities. If parents also have ADHD tendencies (which is the case for most children with the disorder), he or she might have difficulty organizing and executing activities for their kids on a daily basis. So what's a parent of ADHD children to do over the summer? Here are a few tips. Plan a few fun activities with your kids and spread them evenly throughout the summer days. Get a big calendar and write your plans there so the kids can build up anticipation for these exciting activities during their free time. What kind of activities should you come up with? Play dates, day trips to the beach or mountains, or a hike in the woods are good places to start. Ask your kids what they want to do most this summer. Keep basic routines and household rules in place. Kids with ADHD require structure, especially during the summer. It's all right to be more flexible about what time the kids go to bed and wake up in the morning, but try not to make it too different from your regular routine. For instance, if their regular bedtime is at 10 pm, they can stay up until midnight during the summer - but no later than this. Kids with ADHD require adequate sleep so they don't become cranky in the morning. It's also important to keep giving your children responsibilities around the house - just because the kids have no school, doesn't mean they are exempt from chores! Set aside some time for unstructured activities. Children with ADHD are very creative, and they need time to express this side of them. Provide time for your kids to entertain themselves or "do nothing". Tell them that it's okay to be bored, and point out that there are many things they can do to keep themselves amused for hours. Sign them up for summer classes. Summer is the perfect time for the kids to try a new sport or hobby. If it's within the budget, sign your kids up for summer workshops in art, music, theater, or dance. Take some time to relax. It's not easy for adults with ADHD to relax, especially in the summer when your days revolve around the kids. However, it's important for your well-being to find time to recharge your batteries and do the things you enjoy. 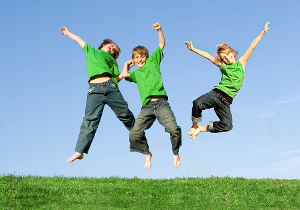 Let your inner child out and rediscover the excitement of summer with your children. Dr. Yannick Pauli is an expert on natural approaches to ADHD and the author of the popular self-help home-program The Unritalin Solution. He is Director of the Centre Neurofit in Lausanne, Switzerland and has a passion taking care of children with ADHD.